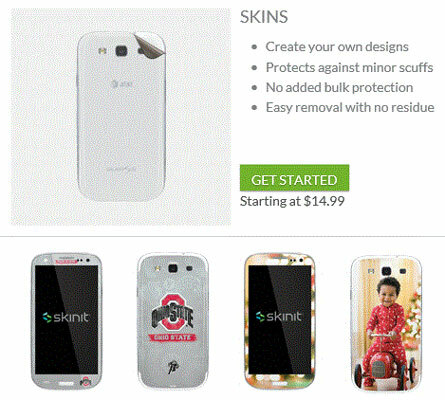 The Samsung Galaxy S6 is attractive, but if you want to spruce it up even more, you can get a wrapping (such as from Skinit). There are designs to express more of what is important to you. As a side benefit, they can protect your phone from minor scratches. The following figure shows some design options for a skin. It comes with cut-outs for speakers, plugs, microphones, and cameras specifically for the Galaxy S6. Putting the skin on is similar to putting on a decal, although it has a little give in the material to make positioning easier. The skin material and adhesive is super-high-tech and has enough give to allow klutzes (who struggle with placing regular decals) to fit the nooks and crannies of the phone like an expert. If you’re not crazy about their designs, you can make your own with images of your own choosing. Just be sure that you have the rights to use the images!